There are only a few computer systems I remember well from my youth – the Apple II line, the Commodore Vic-20/C64, the IBM PC (which at the time was far too specialized for home users) and the Atari 400/800. In the very early days of home computing, the Atari 400 and 800 were actually more “gamers'” computers than any of the others (though that would change later). In any case, all of these computers were too expensive for my family initially, and when we did finally buy one, it was an Apple IIc. But my mom’s office actually had an Atari computer set up (for what purpose I don’t know) and whenever I’d visit her there I remember playing Dr. J and Larry Bird Go One on One and M.U.L.E. I’d wanted an Atari computer ever since then. I finally bought one a few years ago for around 10 bucks… I actually somehow ended up with two initially, along with a floppy disk drive. During a move one of the systems and the disk drive got tossed to the curb (literally – I hope someone picked them up and are enjoying them now), as I didn’t need them. Most of the good games are cartridge-based anyway, and the disk drive is almost as big as the system itself. 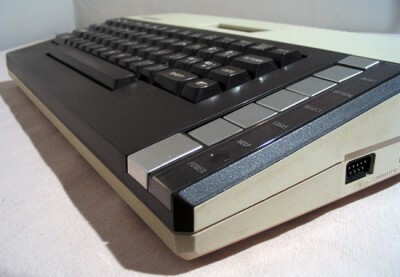 Unlike the Apple II’s disk drives, both Commodore’s and Atari’s drives were really computers unto themselves, with their own CPU’s, power supplies and control circuitry. So they were very large. The 800XL is probably the ultimate Atari 8-bit computer – it was not the last in the line, but it’ll play pretty much everything and it still looks like a classic (unlike the later XE series, which are in a more “modern” beige/grey casing). It’s also superior to both the 600XL and the 1200XL, which despite its higher model number was actually replaced by the 800XL. The 1200XL had some compatibility issues with older software and was also larger than the 800XL with the same specifications. So I’m happy to have this model. I actually bought it thinking I’d get M.U.L.E. to go along with it – I know M.U.L.E. is often thought of as a C64 game but it actually came out on both systems more or less simultaneously and it looks significantly better on the Atari system. But I still haven’t picked it up – apparently it’s not really that common of a game, and it goes for an incredible amount of money on Ebay. Oh well. I still have a few other carts and I enjoy the system.